USA Cycling Coach, USA Triathlon Coach and Licensed Massage Therapist with Experience Triathlon. Works with every level of athlete from first time triathlete or new cyclist to those training for marathons and Ironman distance races. Coaches using a full-body picture concept, focusing on form, technique and biomechanics to help ensure the most efficient use of an athlete's set of skills. Sarah's background to the sport of cycling began during her college years, while living on the East Coast. After many years off, and 3 children later, she stumbled upon the sport of triathlon and hasn't looked back. She placed 2nd Overall in her first triathlon, and was immediately hooked upon the sport, shortly after realizing that she wanted to do more with it by learning how to also coach others into it. She joined Experience Triathlon's coaching staff as a USA Cycling Coach back in 2011, and then proceeded to also become certified as a USA Triathlon Coach with Experience Triathlon in 2013. Her own personal accomplishments include numerous podium finishes as both a triathlete, and as a cyclist. 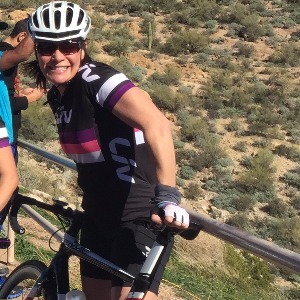 She is an Ambassador with Liv Cycling USA, and is also a massage therapist specializing in work with athletes. Sarah has raced every distance from Ironman to Sprint triathlon, though her first love is being on the open roads on her bicycle, looking for the next adventure. Willingness to learn and try new approaches to training to meet personal goals. Dedication to a plan! Success. Coach Sarah Farsalas has been notified of your message.